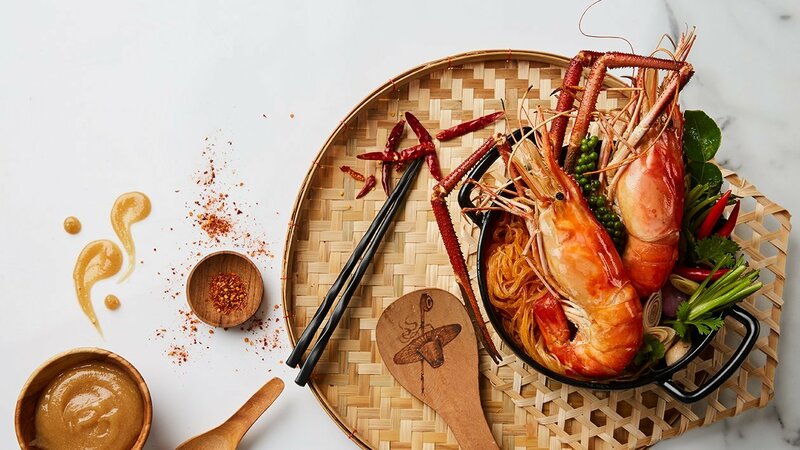 A classic and traditional street food delicacy made with giant freshwater seafood and savoury tom yum flavour. Place the pork belly at the bottom of the pot followed by garlic, shallots, bird's eye chilies, coriander roots, galangal, lemongrass, kaffir lime leaves, eryngii mushrooms, vermicelli and prawns. Place it on the stove and pour the prepared tom yum sauce, place the lid on the pot and heat it until all the ingredients are well cooked and dry. Set aside. Garnish with coriander leaves and red and green chili, and the dish is ready to be served. Tips: Add water if you prefer a mildly spicy taste.